The Heart of Iowa Nature trail travels through Central Iowa from Slater to Melbourne and is part of the American Discovery Trail. The majority is crushed limestone, but also includes portions of paved highway and gravel roads. The trail is wide with an equestrian trail along it’s shoulder. It connects to the High Trestle Trail in Slater and the Iowa 330 Trail in Melbourne. In dry conditions any type of bike can easily navigate a rider from Huxley to Maxwell. It rides flat and with minimal crossings this stretch would also be a fun take kids out on a ride. 30 Days of Biking is here again! Riding every day In April means keeping it fun by mixing things up a bit. 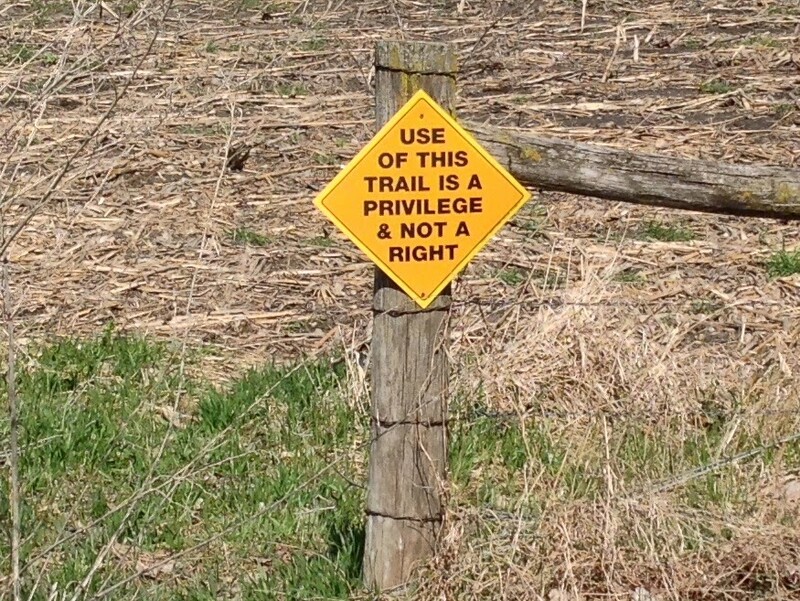 The Heart of Iowa Nature Trail does just that. With it's limestone surface and amazing scenery it deserves to be savored. Like the sign said, "it's not a right". Each time I've ridden it I have certainly felt privileged. A favorite section is the heavily wooded stretch between Cambridge and Maxwell. The trail is in a hallow of sorts with trees towering above. This section is also where I've seen deer and turkey. Cambridge has a small city park to take a bike break, but I prefer the Skunk River. The bridge has areas for pulling over to enjoy the view. Plus, there is a path (rather steep) from the trail to the riverbank. It's a great spot for playing with the camp stove and having a snack. Huxley to Cambridge (and just smidgen further west) is 10 mile out-n-back route perfect for those with kids or folks visiting the trail for the first time. It's also a remedy for anyone searching for solitude. Just be prepared. When you ride this trail miles won't matter, just the moments. Aptly named, the Heart of Iowa Nature trail travels through Central Iowa from Slater to Melbourne and is part of the American Discovery Trail. The majority of the HOINT is crushed limestone, but also includes portions of paved highway and gravel roads. The trail is wide with an equestrian trail along it’s shoulder. It connects to the High Trestle Trail in Slater and the Iowa 330 Trail in Melbourne. Having heard about the landmark along the Collins to Rhodes segment of the Heart of Iowa trail I wanted to see if for myself. It had rained quite a bit the previous night and I wasn't sure what condition I would find the trail. I wasn't too worried though thanks to the fat bike I had rented from As A Dad LLC. The trailhead outside Collins at 730th Ave and 310th Street was the starting point for my ride. There's plenty of parking here, but no water or facilities. The trail was in great condition. It was a smooth combination of moss, grass, dirt, and limestone. The cottonwood trees were letting go of their leaves leaving a sprinkling of brown on the green path. The HOINT is a unique treasure to Central Iowa, providing refuge to folks needing time to get away from busier trails. Here you can experience feeling like you're "out in the middle of nowhere" despite being only minutes from civilization. I certainly felt this way as I pedaled through the timber watching squirrels scatter. About halfway to Rhodes I came upon what I was looking for. The Hoy Bridge. Built in 1912, it is considered to be an undiscovered treasure. The view from atop the bridge is picturesque, but don't just ride across. 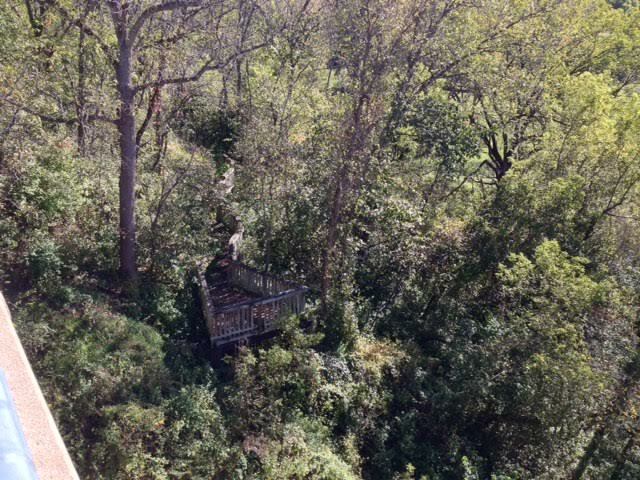 Take a moment and hike down the boarded walkway to see it from the angle it deserves. With it's enormous stone arches it's a sight to behold. Believe it or not, there are cyclists in Central Iowa who hold the opinion that the Heart of Iowa trail should be paved. They describe the trail as "quite unfriendly to the bicycles that most folks ride" and also view paving the trail as an economic opportunity for surrounding committees. I disagree!! This trail needs to be left unpaved. True, not everyone has the luxury of owning a bike for tougher terrain. But, why not walk, run, snow shoe, or cross country ski? The Collins to Rhodes segment would be a perfect place for experiencing the trail on foot. 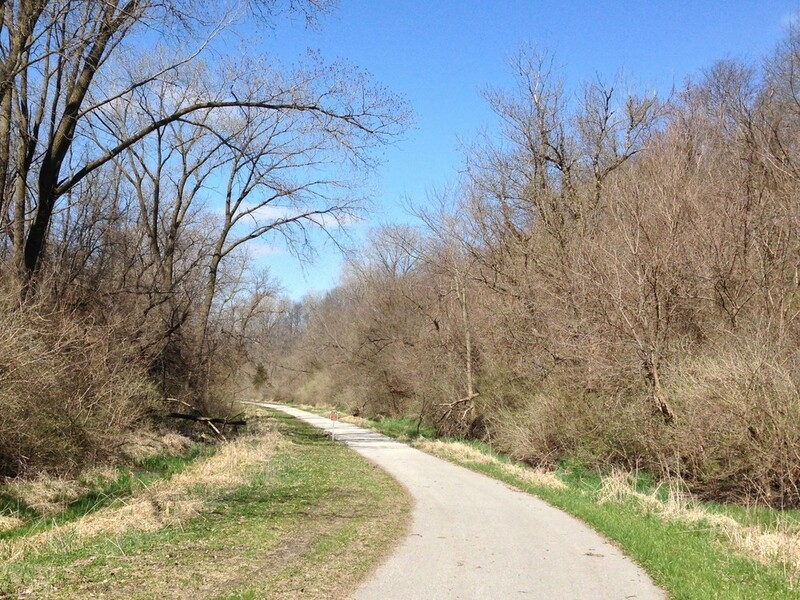 Once you visit, you'll see why the Heart of Iowa Nature Trail should be left as is. Aptly named, the Heart of Iowa Nature trail travels through central Iowa from Slater to Melbourne and is part of the American Discovery Trail. The majority of the HOINT is crushed limestone, but also includes portions of paved and gravel roads. The trail is wide with an equestrian trail along it’s shoulder. Slater, Huxley, Collins and Rhodes have restrooms and water at their trailheads. The trail connects to the High Trestle Trail in Slater and the Iowa 330 Trail in Melbourne. I had heard conflicting reports on the status of this trail. Was it passable? How far would I be able to go? Having borrowed a bike with some fatter tires and durable tread my plan was to leave Huxley and see how far past Cambridge I could get before trail conditions proved too challenging. The Huxley trailhead is a beauty, complete with clean bathrooms, a small amphitheatre, and playground. Making my way out of town I met a group of runners coming back from a morning workout. They would end up being the only people I saw on the trail. I did share it with several critters though. A snake, a toad, and a wooly caterpillar were all on there way to somewhere important. It was windy that afternoon with gusts around 20 mph, but the shelter of the trees turned it more into a breeze. Fall was beginning to show it’s colors along the trail. Yellows, oranges and bright bursts of red made for some beautiful scenery. Trail conditions were ideal between Huxley and Cambridge with the limestone dry and packed. However, between Cambridge and Maxwell things got a little tricky but the mountain bike handled the sand, mud, bumps, and loose gravel perfectly. I felt pretty adventurous as this was the first time I had ridden terrain like this. It was a fun way to add some variety to my usual trail riding. Successfully reaching Maxwell I took a short break on the outskirts of town. I could have ridden into town and found the park or a convenience store, but the beautiful surroundings kept my break trailside. Making my way back to Huxley I thought of how ridiculous it was for me not to have ridden this fantastic trail before. With other trail segments to explore and a mountain bike to borrow I can’t wait to spend more time on the Heart of Iowa Nature Trail.